What Types of Exercise Might Your Senior Enjoy? ← Is Too Much Caregiver Stress Making You Sick? Home Care Services Memphis TN – What Types of Exercise Might Your Senior Enjoy? Finding the right exercise routine for your aging adult may not be the easiest task ever. You might want to start focusing on what she enjoys in general to help you find ways to make exercising more pleasant. Always make sure that you talk with her doctor about whether exercise is okay for her before she starts a new routine. Does She Like Being Outside? People who enjoy being outside when they exercise might benefit from activities that are a little less structured, like playing with kids or pets outside. Or your elderly family member might enjoy going on a nature hike or a walk in the park. Look for anything that happens outside and involves movement. Does She Want to Meet New People? If your senior is a social person, she might prefer taking a class rather than engaging in other types of exercise. Regular activities such as joining a walking group or an exercise class that relies on regular participation can be a great idea. Anything that involves a social component will likely grab your senior’s attention. Does She Prefer Being Alone? Some people prefer to exercise alone rather than with a group. If that describes your senior, she might not enjoy going to a gym or taking a class. Instead, consider setting up some exercise equipment at home for her. She might enjoy walking on a treadmill or trying out exercise videos. If your elderly family member enjoys music then she might enjoy activities that focus more on the music, such as dancing lessons. There are so many different types of dance that your elderly family member could learn a different style every week for a long time. Or she might enjoy exercising with music rather than other types of background sounds. For the aging adult who really doesn’t want to exercise, distraction might do the trick. Try saving your senior’s favorite show for exercise time, for instance, or line up some audiobooks that she’s wanted to listen to. All of these activities can take her mind elsewhere while she goes through the steps of her workout routine. 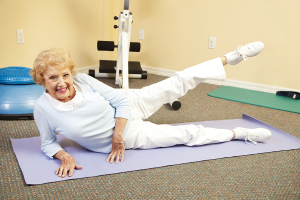 No matter what type of exercise that your senior chooses, safety is extremely important. If you can’t be there with her, consider hiring home care services providers to spend time with her while she exercises. That way you’ll know that she’s in good hands. This entry was posted in Exercise, Home Care Services Memphis TN and tagged Home Care Services Memphis TN. Bookmark the permalink.